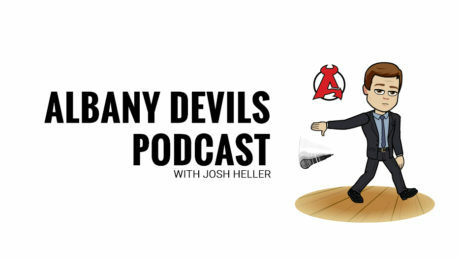 After a holiday hiatus, Josh Heller is back for the Albany Devils Podcast. This week, he is joined by Devils center Kevin Rooney to discuss his rookie season, his transition from college to the pros, and their mutual adoration of Crescent Ridge ice-cream. Heller also breaks down the Devils four game winning streak and glorious theater that was the World Junior Championships. On this weeks podcast, Josh Heller sits down with rookie goaltender Mackenzie Blackwood to talk about life in the pros vs. life in juniors. He also checks in with goalie coach Scott Clemmenssen and how his sophomore season as a coach is going. Josh Heller sits down with forward Joe Blandisi to discuss his sophomore season and how he has taken on more of a leadership role with the team. We also get to the bottom of why his roommates keep getting called up to the NHL (it’s the chicken parm!). Josh Heller sits down with rookie forward John Quenneville in this week’s podcast. The two discuss Quenneville’s love of hockey, his transition from juniors to professional hockey, and how old his gloves are (spoiler alert: they are OLD!). On this week’s pod, Josh Heller looks back at last week’s games, look’s ahead at the weekend’s contests and welcomes Blake Pietila. The two chat about Pietila’s rookie campaign, including his stint in the NHL, stepping up in his second year, and the ins and outs of taking faceoffs. Josh Heller chats with Scott Wedgewood about everything including last year’s roller coaster season, from the injury issues to success in the show, to being the veteran in the crease this year. Head Coach and reigning AHL Coach of the Year Rick Kowalsky sits down to chat with Josh Heller. Rod Pelley may have solidified his role as the leader of the A-Devils, but he still aspires to return to the NHL. Josh Heller previews the 2016-17 season. Josh Heller talks with Times Union Center General Manager Bob Belber about the arena’s facelift. Josh Heller Training Camp, World Cup of Hockey and Ryan Kujawinski is this week’s special guest. Josh Heller and Kevin Zalaznik talk 2016 Prospect Challenge and Nick Lappin is this week’s special guest.